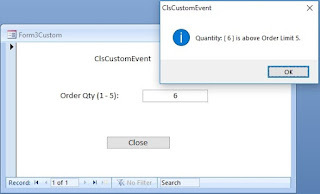 In an earlier article with the VBA Utility program we have seen how to scan through a VBA Module (both Standard Module and Form/Report Modules – Class Modules) and insert Error Handler lines automatically, wherever they are found missing. Find the link to that Article here. I am sure that Utility Program will help you to save time, otherwise you spent on typing/copy pasting and modifying hundreds of lines of error-trap code in your sub-routines or functions. The whole idea behind the error handler is to take care of unexpected errors and if necessary report it to the developer so that the logical error can be rectified once and for all. Besides that the program should not break the code unexpectedly. If it is a minor issue the user can ignore and continue to do what he/she is doing. A particular Project will have hundreds of Sub-Routines/Functions in Standard Modules and Form/Report Modules. When the error message pops up the message will carry the Error Number and Error Description. The message box’s title will carry the Function/Sub-Routine name, if this is included in the title parameter of the MsgBox() Function. But, the user may not notice this valuable information to pass on to the programmer so that he can go directly into that program and do what he needs to do to rectify the error. A better approach to these kind of issues is to create a common Error Handler Program and maintain an Error Log Text File on disk. When an error occurs in a Function/Sub-Routine call the common Function with the necessary parameters (Error Number, Error Description, Function/Sub-Routine Name, Module Name, Database Name). The common error handler program will not only display the error message but also write out the details into a Text File on Disk. 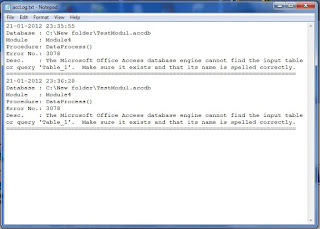 If you have several Microsoft Access based Applications installed on Local Area Network all of them can save the error log information into a single text file on Server’s common location. The error log will carry the Date, Time, Module Name and Database name, besides the normal error values Error Number and Error Description. 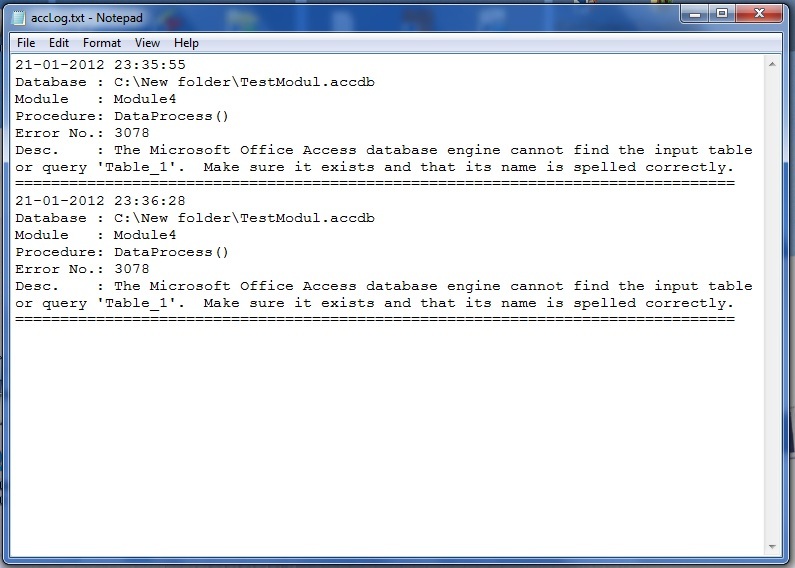 The error log entry have all the details (Date & Time of Error, Database Path, Module Name, Procedure name etc. to pin-point the location of the Error. Even if the user doesn’t bother to report the problem to the Administrator, the Administrator can periodically check this log file to monitor his application’s health. MsgBox Err & " : " & Err.Description, , "BugHandler()"
You can save the above Code into a common Library Database, where you have saved your own common library functions, so that it can be attached to your Projects. This method will write out the details of errors from your databases into a common place accessible to you all the time. When an Error is reported by the User you can directly check the details of it without asking the user to spell out.